SAN BERNARDINO, Calif.-The Latino Education and Advocacy Days project has named Latinos in Social Media (LATISM) as its ambassador for this year's LEAD summit. The day-long summit will take place at Cal State San Bernardino, on Wednesday, March 27, 2013, from 8:00 a.m - 5:30 p.m. at the Santos Manuel Student Union. LATISM and LEAD's social media team will solicit and train interns from CSUSB, University of La Verne, and East Los Angeles College to assist with twitter, facebook, and instagram traffic the day of the summit. Participants are encouraged to use the hashtags #LEAD2013 and #LATISM_LA when participating via social media. Jessica Valle, the director for LATISM Los Angeles will collaborate with Jose Rivera, adjunct faculty at CSUSB's Communication Studies department, in the selecting and training of interns. Student participants will learn the principles of social media engagement and put said principles to use during the summit. "LATISM Los Angeles is very happy to partner with LEAD in helping develop young professionals and help educate in the realm of technology and social media," said Ms. Valle. Vista Hispano held a recent digital Q&A with Joe Kutchera, a true thought-leader on how to connect with and engage today's Latinos. If you haven't read or at least perused his book by now you deserve a chancletazo! Seriously. Hello Joe. It's not everyday that I get to connect with a top Hispanic marketing guru. You literally wrote the book on the subject of how to engage today's Latino market. Thank you for joining Vista Hispano! First of all, thank you Jose for inviting to have a conversation on your blog. And also, thank you for including me on your top 40 list. In your book, Latino Link: Building Brands Online with Hispanic Communities and Content, you talk about why U.S. Hispanics use social networking sites. Please tell us more about what you consider to be the leading factors driving one of the most socially active online population segments in the U.S.? While writing and researching Latino Link, I read a book called “The Culturally Customized Website,” by Professors Nitish Singh and Arun Pereira. It had a big impact on my book. The authors outlined successful website design techniques based on culture, utilizing four matrices of differences between cultures, based on the work of Geert Hoefstede. One of those differences in culture is Individualism vs. Collectivism. Social networks present a much more welcoming environment for collectivistic cultures, most notably, Latin American cultures. Prior to social networks, the Internet was a much more 1-to-1 experience. Search, for example, is a very individualistic experience. A person types in what they want and they receive an answer. Social networks on the other hand present a much more collectivistic experience, not just on Facebook and Twitter but for all of the websites that utilize the sharing and login functionality from social networks. The other important factor today is access to the Internet via mobile devices. We need to look no further than the new report from Pew Hispanic Trust to see that the end of the digital divide is here. Cell phones present an opportunity for everyone to access information that they want and need. And of course applications from the major social networks are consistently in the top most downloaded and utilized applications. Why do you feel it's important for today's marketers to link to social networks where Latinos participate to facilitate interaction and self-expression? It boils down to where people spend time. Young people especially spend a majority of their free time on social networks. This applies not only to Latinos but to all cultures and areas of interest, where people want to share their “passion” e.g. sports and music. The art of communicating with any group today on social networks is listening to them and then identifying the content that most appeals to that audience. Once this is in place, companies can develop content on social platforms to attract and facilitate conversation with their target audiences. What kind of role do you think "self-identity" and "community" play when it comes to Latinos making a product/service decision? The companies that can build online communities successfully can keep in touch and stay top of mind with their fans. It is not for every brand or category though. That being said, it’s amazing how even in the insurance category (something that most people never want to think about), Allstate maintains contact with its Hispanic “fans” on its “Soy La Mala Suerte” character page with over 172,000 likes. While its 1% engagement rate is low relative to other categories, that percentage is 100’s of times better than banner advertising click-thru rates in the insurance category for example. A lot of talk centers around the idea of 'revolucionarios' and/or 'influencers'. For brands and causes striving to engage the Latino market, what kind of dynamics or selection criteria should guide the selection of such influencers as a means of fueling Latino online engagement? Great question. There are two types here. Two, influencers like Chef Rick Bayless, bring Latino culture and food to the masses. Rick is the chef of Frontera Grill, Topolobampo, and Xoco as well as author of eight cookbooks. He has over 301,000 followers on Twitter. You could call him a #GringoLatino. That’s actually a sample chapter of my new book in Spanish, a five-step process to marketing in the age of social/mobile media. Its important for companies to develop new products, services and marketing communications for the next generation of Internet users, many of whom may skip the laptop and jump right to the small screen of the mobile phone. The book offers some great stories from 3M, Banamex (Citibank) Cinépolis (the leading movie theater chain in Mexico), Google, Grupo Expansión (Time Inc), Kimberly-Clark, LG, L’Oreal, Procter & Gamble, S.com.mx, Sears, Unilever, and a number of startups from across Latin America. One of the most exciting and explosive areas of marketing and communications centers around the accelerated pace of digital media. How are trends in entrepreneurship and the ever-popular wave of startup activity impacting how marketers engage consumers both online and offline? Great question Jose. PepsiCo has done a great job addressing that issue. The beverage and snack marketer invited startups to participate in its PepsiCo10 competition where startups compete for funding and a chance to work with PepsiCo’s brands. It allowed the company to generate more marketing ideas far more quickly as well as develop a competitive advantage via new technology. Pepsi invited start-up companies and students to apply for the Fall 2012 phase via a tab on PepsiCo Brazil’s Facebook page. Pepsi evaluated proposals based on an applicant’s ability to partner with PepsiCo brands and commercial viability. Judges included executives from PepsiCo, venture capital firm Highland Capital, and PepsiCo’s advertising agency partners iThink and Omnicom. The PepsiCo10 Brazil winners were then offered an all-expenses paid trip to New York City in 2013 for the opportunity to meet with PepsiCo’s marketing leadership team and network with US-based digital influencers. Appreciate the valuable perspective. Sounds like you're working on some innovative projects and leading the charge in Latino engagement. How can our visitors keep in touch with you? Everyone can sign up for my email updates from my blog/website or send me an email at Joe [at] Kutchera [dot] net. Joe, it's been awesome having you join Vista Hispano for a Q&A. Thank you again for this outstanding opportunity. Wish you all the best in your continued projects and look forward to staying in touch! 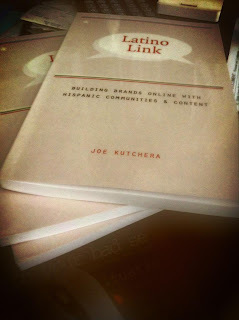 Joe was kind of enough to provide me with 3 signed copies of his book, Latino Link: Building Brands Online with Hispanic Communities and Content featuring a special-edition cover designed by Andrew Kutchera (Joe's brother). Become a fan of Hub 81. Comment with your email address. Winners will be randomly picked and announced Friday, March 22nd at the bottom of this blog post. Note: Increase your chances of winning by doing all three of the steps above. Please, only one entry per step. Congratulations to the following people. Besides being cool gente, you all are the new winners of a signed-copy of Joe Kutchera's book Latino Link: Building Brands Online with Hispanic Communities and Content. Everywhere you look there's probably a very talented individual or organization providing insights and quality perspective into the arena of engaging today's $1.3 trillion Latino market. A recent post on the term "post-cultural" by Giovanni Rodriguez is just one good example of how the discussions around Hispanic marketing have evolved into a collection of very dynamic perspective that transcend the boundaries of language, culture, digital ethnography, communication, social engagement, and public influence. AdAge Hispanic Insights into the Hispanic marketing arena as provided by AdvertisingAge. AHAA The voice of Hispanic marketing. BodenPR Blog Insights and information on developing and rolling out U.S Hispanic strategies from the team at BodenPR. Center for Hispanic Marketing Communication at FSU authoritative source of knowledge, production, education, and professional training in Hispanic Marketing Communication in the United States. CEO Blog Perspective and insight provided by Geoscape CEO Cesar Melgoza. Circulo Creativo Promoting creative excellence and communication among professionals focused on the U.S. Latino market. Engage:Hispanics Perspectives provided by MediaPost. Hispanic Business Top news resource for Hispanic entrepreneurs, professionals and small business owners. HispanicAd The tool for the Hispanic advertising and media professional. Hispanicize Leading social media resource for Hispanic marketers and influencers. Hispanic Digital Consumers Report A IAB and BIGinsight report covering Hispanic Consumers’ purchase intent, media influence, consumer confidence, language preference, top online and mobile activities, video usage and a look at device ownership and usage. Hispanic Digital Media News and insights from LatinVision. Hispanic Market Advisors Information on tapping into Hispanic internet users. Hispanic Marketing Blog by Claudia "Havi" Goffan of Target Latino. Hispanic Marketing and Public Relations News and information by Elena del Valle. Hispanic Market Info A blog for Hispanic marketers. Hispanic Market Weekly Authority on news and events moving the Hispanic market. Hispanic Online Marketing Captura Group's blog featuring best practices, case studies, and research for Hispanic online marketers. Contributions by Lee Vann. Hispanic PR Blog Your guide to Hispanic Public Relations and Social Media News & Views. Hispanic Trending The original Hispanic marketing blog by Juan Tornoe. Documenting Latinos' imprint in America. JoeKutchera.com Official website of Joe Kutchera, a leading social marketing advisor and speaker and the author of Latino Link: Building brands online with Hispanic communities and content. LATISM Blog Latinos in Tech Innovation and Social Media. Más Wired For, by, and about Latinos in Tech focused on showing the incredible contributions Latinos are making in the digital space. Media Rumba Online Hispanic marketing and media ecology blog by Frankie De Soto. Marketing to Latinos (ClickZ) Provides trends, insights, and practical tips on how to reach, engage, and profit by marketing to Latinos. Marketing Trends in a New Multicultural Society Cultural understanding in marketing is a growing branch in the study of consumer behavior. Perspective by Dr. Felipe Korzenny. Mercury Mambo Hispanic Marketing Blog Information on Hispanic Shopper Marketing, Event and Experiential Marketing, Sales Promotions, and Branding. Multicultural Marketing News Information on how to market to multicultural (ethnic and niche) consumer markets. PewResearch Hispanic Center Founded in 2001, the Pew Hispanic Center is a nonpartisan research organization that seeks to improve understanding of the U.S. Hispanic population and to chronicle Latinos’ growing impact on the nation. Pinterest Pins related to the Hispanic market. Portada Leading source of news and analysis on the Latin Marketing and Media space. Reach Hispanic U.S. Hispanic and Latin American resource. ReachHispanics.co Hispanic online marketing blog by Martin Ramirez. Think Multicultural Covers the multicultural marketing and advertising world through the transformative lenses of the digital media. Co-contributors Jose Villa and Danny Allen. Think with Google Consumer trends, marketing insights and industry research provided by Google. The New American Consumer: Trends in Hispanic Consumer Demographics Report Experian offers this informative report, which identifies key trends among Hispanic-American consumers. Twitter Search An active stream of conversation around the #HispanicMarket hashtag. Univision Insights Research and perspective from Univision delivered to your inbox. Who did we miss? Suggestions are definitely welcome! Vista Hispano is the official Hispanic marketing blog of Hub 81 providing insights into the trends and changing demographics of the U.S. Hispanic market. An integrated marketing communications agency based in Santa Maria on the beautiful Central Coast of California. Forward-thinking strategic partner helping clients navigate today's multicultural digital engagement and Hispanic marketing landscape.